In recent years, financial news outlets have barraged investors with coverage on the rise of passive investing, and the ‘death’ of active management. This shift — fueled by lower fees, active manager’s underperformance, and the rise of exchange-traded funds (ETFs) — has been gradual, but significant. A certain level of concern is certainly warranted. 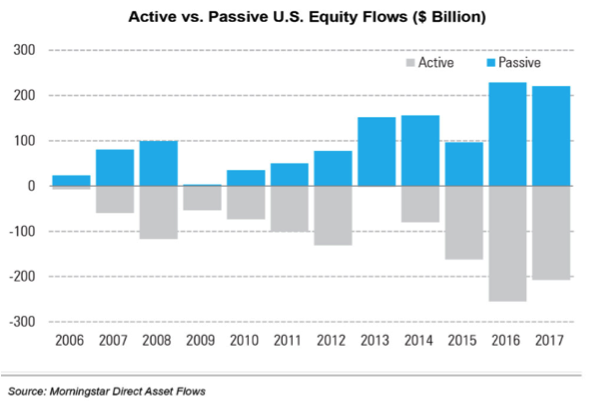 The scale and pace of passive investing’s rise is evident in the asset flows over the last decade. Morningstar reported that at the end of 2017, roughly 45% of all equity mutual fund and ETF assets were passive. In 2007, this figure stood at just 20%. In the midst of these headlines, investors may have been led to believe that the final nails have been driven into the coffins of active managers. This outcome, however, is unlikely. Throughout history, human nature has exhibited an affinity for risk, competition, and a refusal to settle for the average. Whether this mindset leads to positive or negative outcomes has been secondary to our decision making process. 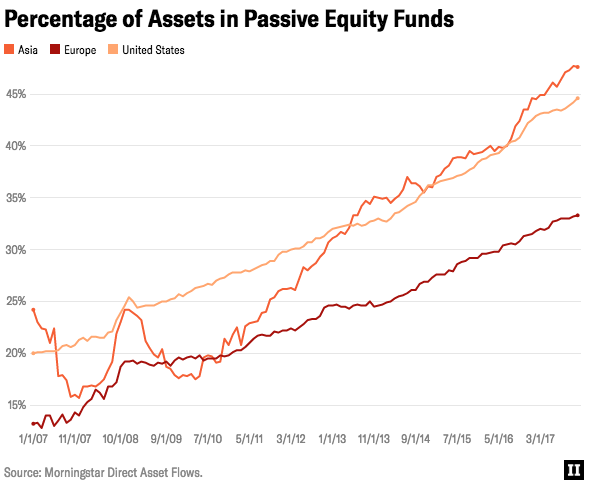 There is no doubting the rise in passive investing. However, the notion that such strategies will replace the majority of active managers is up for debate. Active investing dates back further than the Roman Colosseum. In the 3rd century BC, three centuries before the magnificent structure was erected, the trading of societates publicanorum’s shares quickly rose in popularity. In order to understand the founding of the ancient stock market, however, we must first study the role of the publianci, and the societates publicanorum. The extensive realm of the Roman Empire necessitated outsourcing many public services to contractors across various territories. 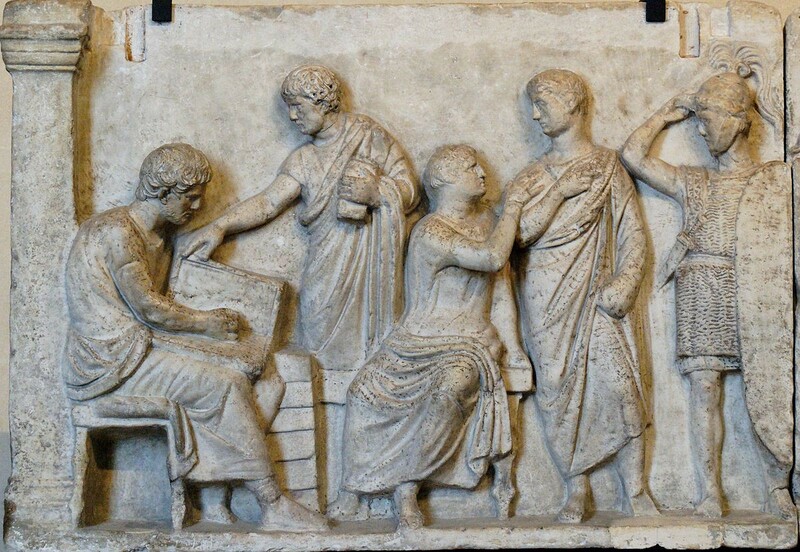 These contractors, known as the publicani, played a vital role in the Roman economy. Most importantly, the publicani managed the empire’s taxes. This role of tax collector was an extremely profitable venture, and a contract that the publicani aggressively competed for. Under this system, the contractor paid the expected tax revenue from a designated province to the government in advance. Later, the publicani could then profit from any surplus tax revenue they collected from that province. As an additional source of revenue, the publicani’s original payment to the government was treated as a loan, which meant that it accrued interest. The profitability of these tax collecting enterprises quickly led to the establishment of societates publicanorum, which were structured similarly to modern corporations in the fact that they possessed both shares, and shareholders. Even more incredibly, the societates publicanorum had multiple share classes. 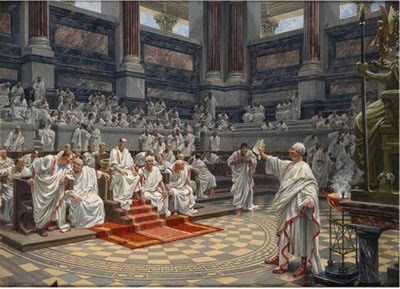 In this period, Roman statesmen referred to the ‘large shares’ (magnae partes), and ‘little shares’ (particula) held by investors. The differing share classes appear to be early equivalents of preferred, and common equity. According to Polybius, a contemporary historian, almost every citizen in Rome held shares in the societates publicanorums. The widespread group of traders speculated and exchanged their shares at the famous Roman Forum, located near the Temple of Castor. Today’s remnants of the ancient exchange. As expected, many of the issues and concerns that face market participants today also existed over two thousand years ago. Cicero, a renowned philosopher of the time, voiced concerns over market valuations as he warned of “shares that had traded at a very high price”. Cicero’s statement implies that shares of the societates publicanorum were being purchased and sold based upon their valuation and price, which is the same strategy employed by active managers today. One of Cicero’s many speeches. Even in the age before Christ, active managers came under scrutiny. Similar to today’s proponents of index funds that tout their simplicity, and slightly less risky nature, Cicero warned that conservative men should avoid trading shares, as the practice was akin to gambling. Today, many active managers warn of passive investing’s effect on price discovery. Although the Romans did not face this challenge, they were certainly privy to the fact that speed and access to information were crucial for successful trading. In the 3rd century BC, a complex system of couriers was established across the empire to quickly relay financial information and data back to traders on the Forum’s stock exchange. 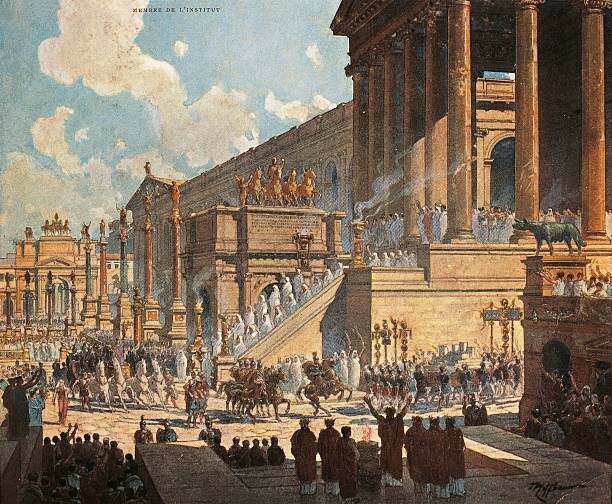 Eventually, the first stock exchange declined with the Roman Empire as its reign finally drew to a close. After the empire fell, the rise of Christianity and other religions prevented the establishment of a market similar to the Roman Forum. Religious laws against usury (charging interest), as well as the feudal system later adopted in Europe, removed the entrepreneurial and capitalist spirit that had ensured the Roman market’s success. However, this decline in the market of active investors did not last. While the challenges that the Romans faced may have temporarily subdued the role of active investing, the impact was not great enough to eradicate the industry. As we know, early stock markets began to form in Italy during the 1300s, Antwerp in the 1600s, and then on to Amsterdam and England. In these periods, active investing thrived, and the concepts and practices that had existed for over a thousand years rose to prominence once again. Today, active investing faces yet another challenge. Passive investment options do pose a threat to active managers, but just as the industry weathered headwinds after the Roman Empire’s decline, it is unlikely that passive funds will seal the fate of active management. As the industry has dealt with similar threats since the 3rd century BC, this Publicani would bet that humans continue to ‘do as the Romans do’, and attempt to outperform the market average through active investing.